Does ‘Smart Controls’ Only Mean Convenient? 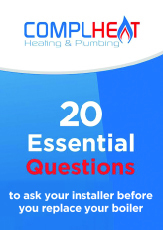 Why Is An Annual Boiler Service Essential? Are Central Heating Smart Controls for me? Are you getting the most out of your radiators? I consent for my data to be used by Complheat to process my enquiry. How my data is used? Contact us today for a FREE, no-obligation quotation. All boiler & central heating install, repair and service work. Complheat Heating & Plumbing is a trading name of Complheat Heating & Plumbing Limited. Registration No. 07235476 registered in England and Wales. Registered Office: Unit 52 North Mersey Business Centre, Woodward Rd, Kirkby, Liverpool, United Kingdom, L33 7UY. Complheat Heating and Plumbing Limited is an Appointed Representative FRN767464 of Shermin Finance Ltd, which is Authorised and Regulated by the Financial Conduct Authority – FRN 727594. Shermin Finance Ltd is a Credit Broker not a lender. They offer Credit Facilities from a panel of Lenders.